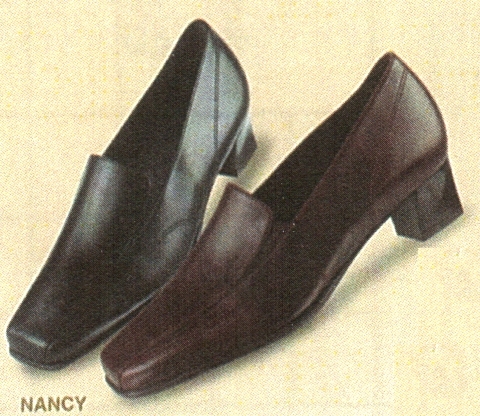 The Nancy is a fine, ladies calfskin leather slip-on with heel. Contemporary styling, with anatomically designed removable footbed for great support. A member of Theresia's core offering of fine footwear. An emphasis on fit, your whole body benefits from wearing a Theresia shoe or sandal on your feet. Designed for the anatomy of the body from the bottom up, TheresiaM has been the mainstay of the finest retailers in womens comfort footwear for years. A recent interruption of imports into the U.S. provides you with an opportunity to own a Theresia M. at discounted prices. We hope that Theresia will continue to provide the American market with their outstanding footwear in the near future. For now, we are proud to offer them while supplies last. If you already wear a Theresia, then you can enjoy the same great fit with Theresia shoes of different styles in the same size and width. What will change is the toe characteristic: varying from round, oval, to oblique toe. Theresia shoes are available in U.S. sizes for length, running true to the Brannock measurement. The G width can be described as a generous US medium. Both G and H are made to fit snuggly on the heel, with comfortable toe room for healthy walking and maintenance of your foot health for years to come. Made in Germany following a long tradition of craftsmanship, these fine womens shoes meet the highest standards of quality, from precise stitching to rich calfskin leathers in a wide variety of patterns and finishes.